… my son could barely walk. He was so weak. When he got up to walk to the refrigerator, he was wobbling. Before I knew it, he fell straight to the floor. Boom! I felt so helpless. There was nothing I could do for my son. I picked him up and laid him across my bed. The blood vessel in his neck was throbbing hard and fast. I called my mom, but was too choked up for words. When I was finally able to speak, tears overflowed my voice, pouring faster than my words could come. When we got to the hospital, they ran tests. They could barely get blood from his veins. There my son lay like a vegetable and I was losing my mind. I reflected on all the promises God told me about my son when he was in my belly. I reminded God of all the things He had told me and repeated them back to God one by one. “Oh God, what about your promises? God, when my son was in my belly, you told me he was special and born for a purpose. God, you told me when Ray´von was born that he was to lead your people. You told me that he was going to excel and bless others. You told me! How can anything happen to him!” I was in disbelief and although I doubted God’s promises, I knew my son was in God’s hands. Well, stress began to take it toll, ....Crying spells and sleepless nights overtook me. I cried all the time, at night and during the day, I cried when I had to go to work, I cried going in and coming out of the building. I could not contain it if I tried. I could not sleep or eat. I had headaches that wouldn’t go away. My menstrual cycle was terribly off balance. I got frustrated and angry easily. When I decided to seek help, I was diagnosed with major depression. Major it was! Mental illness is serious. I was slipping into being homicidal. I was ready to hurt someone for causing the damage to my home life relating with my son. So there I was being swept away by overpowering wind and flooding rain. 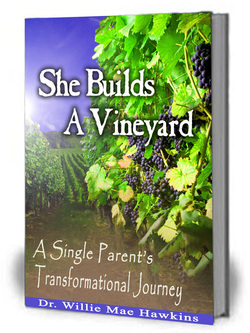 There came a time in my vineyard when love, peace, quietness, and the Spirit of God no longer reigned in our home. Surely he felt my soul crying out. Indeed, it saddened him when his momma was crying all the time. I guess it was a breaking point for him as well. He was just as tired as I was. He needed the change just as much as I did. The moment when I could not pray, he led the way. Beyond my pain and tears, the core of my being began to have hope and there was an ounce of joy in my soul. I could feel the God who once lived in my home, the God who had heard my heart several times before.